2017 In A Sentence: After guiding the Lions to a 6-5 mark in his 6th season as head coach, Ron Roberts was hired away from Hammond by UL-Lafayette to become their new defensive coordinator. Biggest Shoes to Fill: More than any player, head coach Frank Scelfo needs to step into a solid Southland Conference program and make sure that the gains made by Roberts are continued, especially on the defensive side of the ball. Scelfo was the offensive coordinator at UTSA and might be able to develop the Lions’ offense a bit more, so Scelfo’s offensive mind and continued strong defensive play could be a great combination. Key Player: With 646 rushing yards and some big-play ability, sophomore RB Marcus Cooper could be the back that Scelfo will work with to build up the Lions offense. 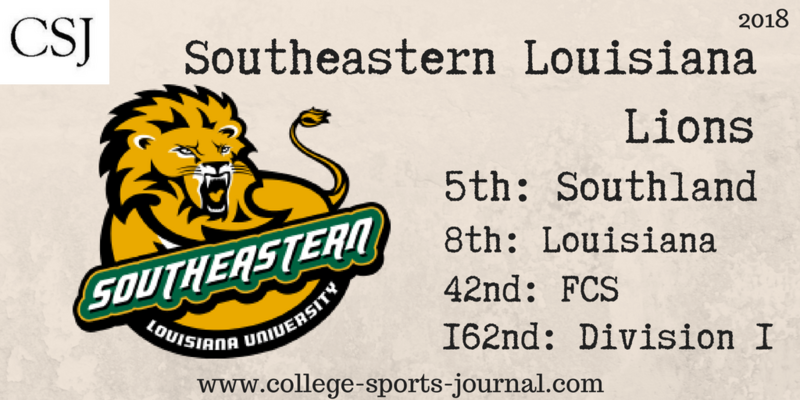 As a freshman Cooper had four 100 yard rushing games, and his development will help develop Southeastern’s offense. Fearless Prediction: at Louisiana-Monroe, at LSU, vs. Central Arkansas – not exactly a great recipe for Scelfo’s first Division I victory as head coach in his first three games. A weak Southland schedule will allow the Lions to probably finish just above .500 again. Can they figure things out quicker than that and compete for a conference title, possibly?